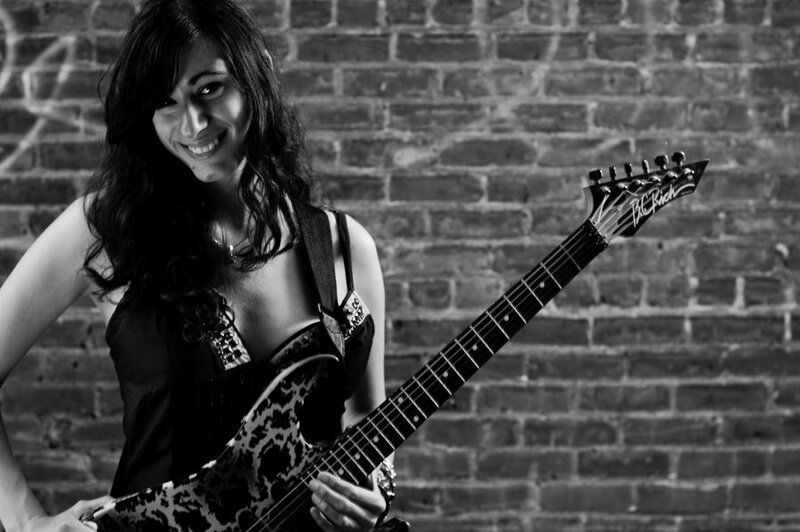 The the fact that she’s an amazing guitarist should be good enough for you to want to keep a close eye on Nili. 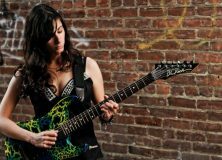 How about the fact that her resume is stunning for a 24 year old – she’s done quite a bit – she currently is Tony MacAlpine’s companion guitarist for his touring band, and she’s worked with folks like Guthrie Govan (and the rest of the Aristocrats), Andy Timmons, Stu Hamm, and the Iron Maidens. Nili was born in Israel, and lived there until she was twelve years old, and then moved with her family to Boston. That’s where her guitar career got its start. She went on to become a instructor at Berklee College of Music’s summer programs (starting at age 19), where she went to school herself, just a few years earlier. 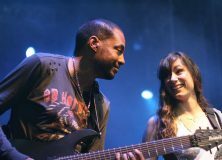 One of the best examples of Nili’s work is this video, where we get to see her rocking out with Tony MacAlpine. Tony needs someone to take over when he has to take his hands off the guitar to play the keyboards, and Nili is waiting right there to get the job done. Also in this video we get to hear Nili and Tony joining forces with a host of inspiring dual lead melodies. 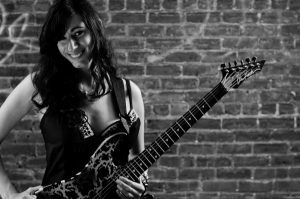 When it came time for Nili to audition for the gig with Tony MacAlpine, she had to pick up the 7 string – and fast. She had just a few weeks to come up to speed on it (so to speak). She started by learning songs she already knew – just getting used to that extra string being there can be a hurdle – and then she started to work that “extra range” into her style. I think we can safely say that she’s got it licked now. 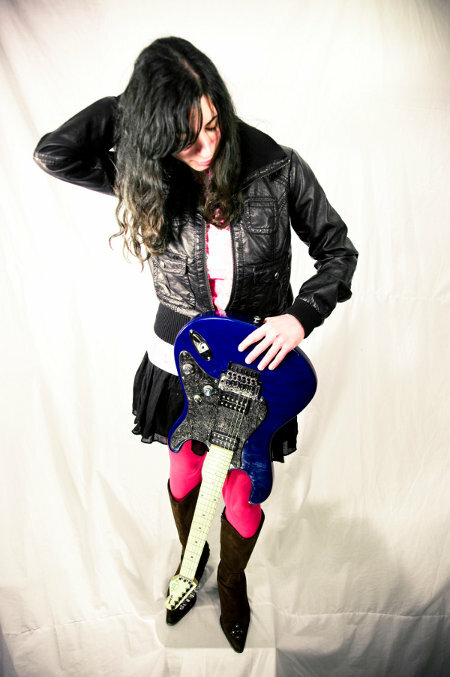 In Mid-December, 2011, Nili signed on as an Ibanez Artist, and uses Ibanez guitars exclusively. She is currently playing two 7 string models – an Ibanez RG Premium 927 with a Quilted Maple top – and a RG Prestige 1527. This is an amazing video, showcasing some of Nili’s amazing chops at times, heartfelt finesse at others – and the thing that struck me within the first two minutes of this video – her perfect bends. She’s bending up quite a bit in this song, and they’re all perfect bends. She’s definitely got some strength in her hands, and amazing articulation and phrasing. If you don’t feel something when you watch this one – might want to check your pulse! I’ve got Through The Looking Glass in regular rotation on my cell phone, and I love this album. It’s an incredible mix of style and energy. Nili has got her own thing going and it’s creative, personal, and all her. It’s the kind of album that you listen to the first time, and you don’t want the current song to end, but you can’t wait to hear what the next song has in store for you. 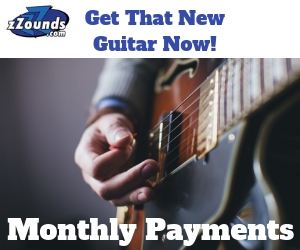 At the end of the experience you’re not burnt out – it’s all killer guitar music, but it isn’t too thick – it’s really an enjoyable listen. Here at Guitar-Muse, we listen to a lot of guitar albums. I’ve got a folder on my computer full of stuff folks have sent us, and most of it is good, but a lot of it sounds like someone else. While I can hear elements of Petrucci, Eric Johnson, Guthrie Govan, Vai, Satriani, and others in some of Nili’s songs, it’s all fresh. Part of this is from her almost fearless use of rhythm – there are rhythmic “surprises” that give the ear something new and exciting to enjoy – all spaced out perfectly in the music. You get the impression that Nili didn’t rush through her background tracks just to get to the fun stuff. Speaking of the fun stuff – of course the lead guitar is her vocalist, and Nili delivers everything from well thought out lightning fast runs to delicate Jazzy flourishes, and what I consider her trademark – for a technical guitarist – the pure feeling that comes out all the time. Whether it’s an anthemic bit (she nails these every time) or when she pulls back awhile for a slower section, you know she’s feeling it because you are too. Like I said, for a technical guitarist to be able to follow a 200 mph run with something you can feel all the way down to your little toe – that’s pure talent. 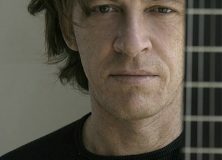 Nili also wrote all the material and produced the album. So, I’m not going to mince words anymore here – get this album. Through The Looking Glass – you can get your hands on it right here. If you’re the CD Baby type, you can get Through The Looking Glass here. We’ve definately got something more to look forward to – she’s in the tracking process at the moment, and the new album features artists such as Marco Minnemann, Bryan Beller, Alex Argento, Virgil Donati, Aquiles Priester, and more. Nili hopes to have something ready for release by summer or fall of 2013. Nili is a world class guitarist – with an uncanny sense of timing, brilliant phrasing, and lightning fast super accurate dexterity – so keep your eyes peeled for more of Nili in the future! You can stay connected with Nili by visiting the links below.